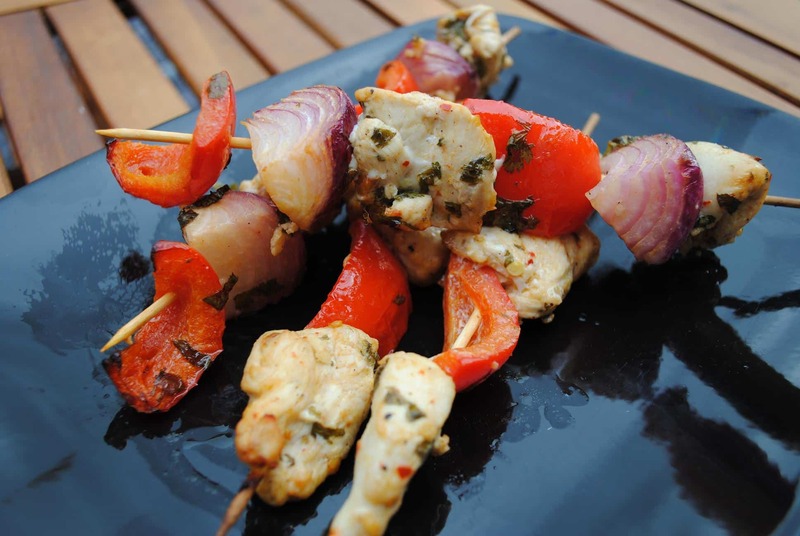 These Marinated Chicken Skewers are a great addition to any buffet table, marinated in a blend of herbs and spices they can be grilled or oven cooked. I haven’t updated all weekend, and I wish I could say it is because I had some crazy weekend full of exciting plans, but it was actually pretty relaxed. Not that it’s a bad thing of course. I spent my Friday night at the gym – told you it was a wild and crazy weekend! I didn’t get up in time on Friday morning to fit in my workout, so I just made it work by fitting it in later in the day, even if that meant being there on a Friday night. It was so nice to see groups of young people in there together working out. I think it is awesome that they chose to be there, working out together, instead of going to a bar and getting drunk. It’s good that so many people, myself included, have “fit friends” who share the same kind of healthy lifestyle. It makes it easier to do things together that don’t always involve eating and drinking. Saturday was my rest day from working out, which was much needed. I’ve just started at the gym again, and I have started back on the Couch to 5k training. I was doing it a few months back, but stopped, and I have been wanting to get back into it for ages. I’m feeling much more confident about it. You can read my previous progress on the plan here and I will update it when I get further than I did last time (I only made it to week 3). I am positive I can run further than this week is telling me to, but I want to stick to the plan. Yesterday I had my friend Claire over for dinner and I made her my Cajun Chicken Pasta which went down well and then for dessert I served up my new ice cream alternative. I can’t wait to share that recipe with you all. It is so, so good! After dinner, Claire was telling me about a Zumba class she has been to that is in the dark with disco lights. I love Zumba anyway, but this sounds amazing. We have arranged to go in a couple of weeks time. At least no one will be able to see when I mess up the moves. I am now just waiting for my achy husband to return home from work. He played in football match yesterday and as well as coming home with a grazed knee (he fell over), he is walking like a 90 year old. This morning when he walked down the stairs, every step was met with either an “ouch”, “arghhh” or “erghhh”. I think he is playing on it for the sympathy. Okay, okay – onto the recipe. Carrying on with the meze recipes, this one is really simple and is perfect for BBQs, picnic or as part of a dinner any night of the week. Mix all the marinade ingredients together, or you can put it in a blender if you want a smoother marinade. Add to the chicken, pepper and red onion and put in the fridge for at least an hour. Thread onto skewers (remember to soak the skewers for at least 30 minutes if using wooden ones). Grill for around 10 minutes, turning frequently. How was your weekend? Was it as “crazy” as mine? I was just thinking the other day that I wanted a good chicken marinade recipe, thanks! Zumba with disco lights sounds brilliant too. The no hangover thing is definitely a bonus. The older I get, the worse they get!